Advent Calendar Day 20: Mantegna! 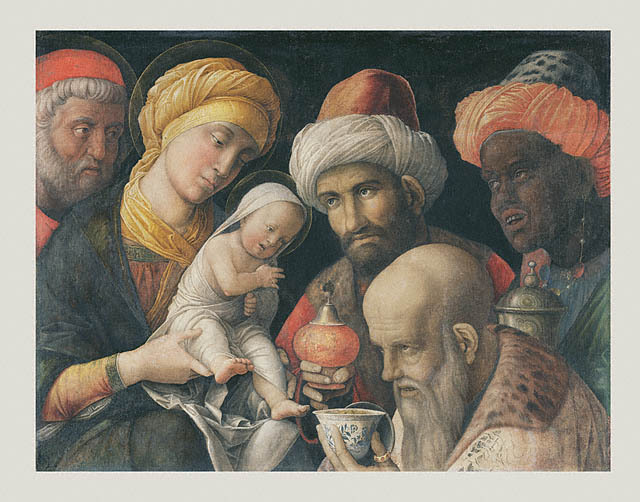 Adoration of the Magi (1462) by Andrea Mantegna. It’s rather early for Magi, but we* here at Clamorous Voice Towers refuse to be bound by convention. When this painting was sold at Christie’s on 18 April 1985, it cost £8,100,000, making it (at the time) the most expensive painting in the world. The artist, Andrea Mantegna (c. 1430-1506) was born near Padua, married into the Venetian Bellini family, and received his first important commissions to paint frescoes for Padua’s Eremitani Chapel. However, he spent much of his working life in Mantua, including several years as court artist there. The Gonzaga (Mantua’s rulers) knighted him in 1484. The painting dates from about 1600, and is distemper on linen; a closer view of where the linen has become visible through the paint is visible here. You can see Adoration of the Magi at the Getty Center, Los Angeles – or, indeed, online, which is why digitization matters. *Obviously, Clamorous Voice Towers is nothing more than my mind palace. Advent Calendar Day 8: Guadalupe! 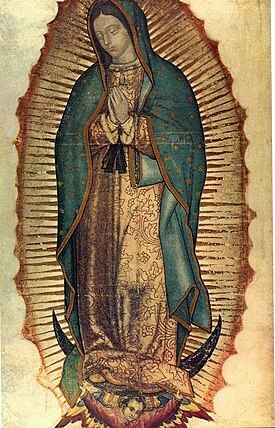 This image shows Our Lady of Guadalupe, one of the most famous icons of the Virgin Mary, and Mexico’s most celebrated religious image. I’ve included it because it displays Mary as Christians think of her during Advent: pregnant with the baby Jesus. I am not an authority on art, but the reason we know she’s pregnant is not because of any changes to her body, but because of the black ribbon wrapped round her dress in an empire-line; this was the traditional Mexican indicator of pregnancy at the time the icon was produced (the sixteenth century). The icon is housed in the Basilica of Our Lady of Guadalupe, north of Mexico City. The Basilica is close to the location where Catholics believe Mary appeared to the indigenous Native American, Juan Diego (1474-1548). Hat tip to Br. Stephen Morrison of the Norbertines of St. Philip’s Priory, whose “Devotional Images for Advent” got me interested in images of the pregnant Mary (again – when I was little I used to love drawing a v. pregnant Mary on the back of a much smaller donkey. And poor old Joseph). Cheery and not even slightly suggestive image of Jonathan with David, the latter sporting gorgeous must-have-this-season dead!Goliath accessory. Found in St. Giles's Cathedral, Edinburgh, photo by Lawrence OP. Petition to allow Anglican clergy to bless civil partnerships in church. In December 2011, it became legally possible for civil partnerships to be blessed in houses of worship. Currently, Anglican clergy are not allowed to do this, but a growing number seek to do so openly and without threat to their careers. A letter to this effect was printed in The Times, and signed by over 120 clergy from across the Diocese of London. c) the celebrant, assistant, or clergy in the congregation having to worry about the ramifications for their present and future careers. This is a long way from what the Diocese of London is asking today. However, I truly believe that the success of this petition would be the first step to achieving everything I’ve described. So, if you sympathise, please sign here. With most of the media overtaken by the horror that is the News of the World phone-hacking scandal, the General Synod is – understandably – quite low on the news radar. For the Anglican Church, this is a good week to bury bad news – or, indeed, bad theology. Following the Guardian‘s liveblog yesterday, I was surprised to see the issue of “open table” communion up for date. This is the policy by which (as many churches word it) anyone “in good standing with their own Church”, “baptised Christians” or, simply, “anyone who wishes to” may come forward and receive Communion (the bread and wine) during a normal Eucharist, regardless of whether they’ve been confirmed. To my horror, I found out that generous, sane practice is actually illegal according to Church law. The liturgy of the Eucharist emphasises individual preparation and emotional openness before God: the last words we speak before going up to the rail are Lord, I am not worthy to receive you, but only say the word, and I shall be healed. Our own willingness to take communion, to unite ourselves with the “one body” that shares one bread and one cup, is what puts meaning into those words, but we are still “unworthy” to receive God; we’re all imperfect, struggling human beings and only God can change that. Whether or not we’ve gone through Confirmation doesn’t change or essential humanity, or “earn” us the right to receive the fruits of Grace and a sacrifice, made through the Crucifixion, which we can never hope to deserve. How can it be that someone can stand in church, say the Eucharistic prayer, mean all the promises it contains, but still be barred from its culmination, Communion? What on earth is a non-confirmed person meant to do, stand there in silence? Nobody should have to take Communion, of course, and I think it’s great that people can just come up for a blessing (although I think that can seem quite daunting in its own right). But if, in the course of a Sunday service, someone is moved to receive the body and blood of Jesus Christ (or its memorial equivalents, depending on their belief), and to put themselves into that intimacy with God, whether it’s for the first time in their lives or after an extended period away from religion, absolutely nothing should stand in their way. I can’t imagine anyone taking Eucharist for the “wrong” reasons – I’m not sure what those would be, and I don’t think it could meaningfully devalue or “damage” the ritual in any way. I have never understood why children old enough to consume the bread and wine in safety, who attend church regularly and are part of church life, are less entitled to Communion than adults who never come to church, but who went through a Confirmation ceremony thirty or forty years ago. Rightly, adults with dementia are allowed Communion, as are those whose learning difficulties would make the prescribed course of Confirmation preparation (even though such preparation is wildly non-standardised) imposible; accordingly, the issue of intellectual-understanding-as-entitlement is already recognised as irrelevant in some cases. 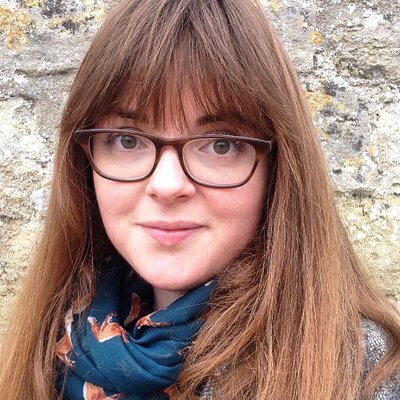 I was confirmed at thirteen, following all the usual preparation and by a bona fide bishop; I am now twenty-four, and, I hope, have a better and deeper understanding of Christianity both through education and lived experience (n.b. this is totally without any claims to being a better person). I don’t think that makes me more entitled to Communion now than I was previously. The whole issue of entitlement stinks. Nobody who wants to make the commitment, receive the comfort, or join in the community of the Eucharist should be denied the opportunity. Anglicans are supposed to believe in a God of enormity and power – one who created Heaven and Earth, and then sent his Son to die a miserable, agonising, death. Before bringing him back from the dead. I have never understood how someone so awesome, transcendent, so obviously supernatural in force, could be supposed to even care about the petty, legalistic and so obviously man-made trifles that make up so much of what’s spiteful and divisive in Church debate. Additional translation: if you feel you want to take Communion, do it. God won’t care, he’ll be glad, stop worrying, & furthermore the Anglican Synod (with the exception of the cool/sane/honourable Malcolm Halliday &c) are bureaucratic idiots who depress me hugely in their refusal to ratify the open altar and practice what Jesus told them to preach. Previous Thursday retrospects can be found below! Some were even published on Thursdays. Travel plans are afoot; Berlin in June/July, Kent in August and (I so hope) Positano (with Ravello and Sorrento, oh my god) in November. Recommendations for Berlin & Positano extremely welcome! It was my birthday! I am now 24, which is older than practically every fictional character I’ve ever loved, except for Harriet Vane and several of the Forsytes. I am also the proud owner of MANY SHOES, a dress, MOLESKINES, lovely jewellery, my very own tiny turning-into-John-Simm watch-on-a-necklace, Henry Holland tights with the Eiffel Tower on (from Chloe) and Much Ado tickets (<3!!). Yes. Continuing the #acquisitionspam, I am now reading Keith Osborn’s Something Written in the State of Denmark and will shortly begin The Invention of Murder. How to get The Selby in your place. I have taken my own advice from a year ago, and registered for Britgrad 2011. On that note, if you need to write on .pdf forms electronically, PDFExpress is your friend. One of the most useful things on the internet. I am tempted to get a Tumblr. The final articles have been chosen for Issue 4 of Victorian Network, which will have the title Theatricality and Performance. As Submissions Editor, my part in the cycle is largely over… as Editorial Board member, I’m sure there will still be plenty to do. Fellow dead Victorian things enthusiasts may well enjoy photographer Ingrid Newton’s latest, absolutely beautiful post on London memorials. I am a big fan of Ingrid’s work, but particularly enjoyed this photograph. Ingrid describes the Postman’s Park memorial to those who have died via acts of self-sacrifice. The designer, as the above image shows, was George Frederic Watts (1817-1904), the first husband of Ellen Terry (who, of course, is a major subject of my thesis – though Madge Kendal may usurp the no. 1 spot). Watts had proposed a national monument to unsung heroes to coincide with Queen Victoria’s 1887 jubilee; when he received no response, he decided to go ahead with the idea himself. I suppose the online memorial sites, newspapers, and things like the Pride of Britain awards fulfil a similar function today, but there’s something infinitely more poignant about the little ceramic tributes. They remind me of the tablets offering thanks for answered prayers you find around shrines in French churches. Notre Dame, 2009. In a shock twist of fate this was taken by my amateur self, notice how the most interesting tablet's in the bottom-right corner and I have OMITTED it. 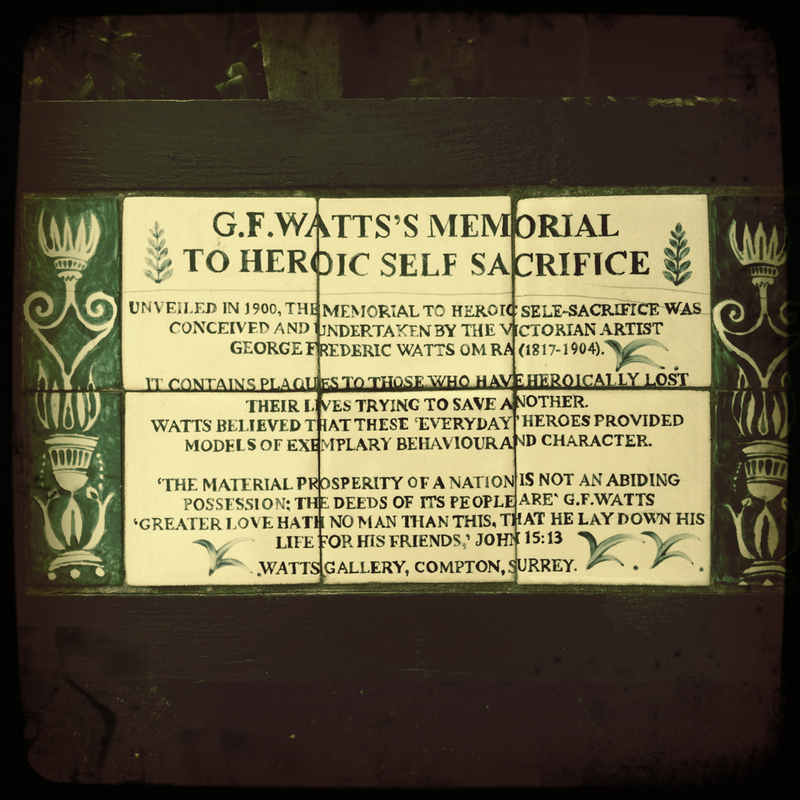 The emotional impetus in Postman’s Park seems far sadder – but, then again, Watts’s memorial is still about thanksgiving. 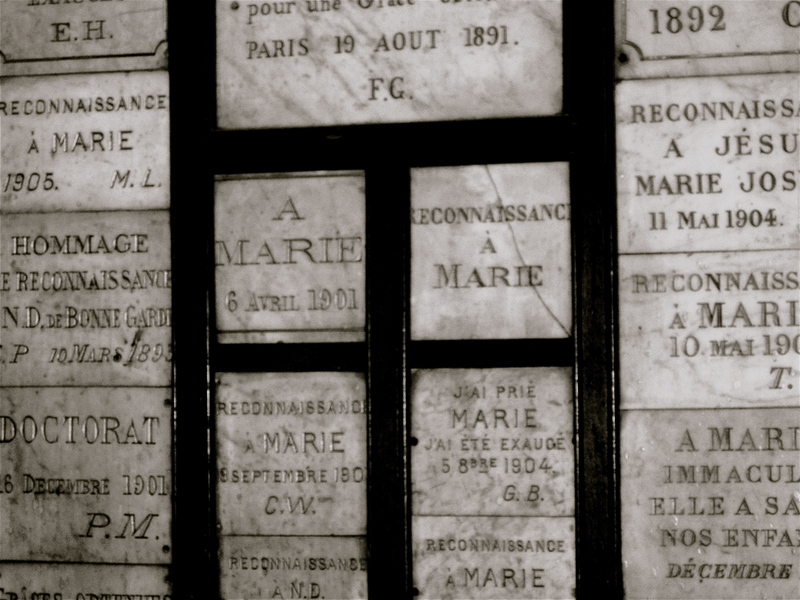 Several of the tiles commemorate children. As Ingrid’s post reminds us, the length of time for which someone is remembered is a fraught issue. Who is remembered, how, and by whom? It’s an issue I’ve been grappling with thanks to an unexpected and exciting development in my research. When I started investigating the writings by these actresses, I automatically discounted the possibility of contact with anyone who knew them. Even “discounted” is too strong a word: it didn’t enter my head. And yet, I am now in correspondence with one of my subjects’ granddaughter and great-granddaughter, and hope soon to read some of their family manuscripts. The granddaughter is now 91; the link is there (there are other issues, about biographical vs academic remembrance, and whether some people should be remembered at all, but that’s a different post). These thoughts are rather disconnected, but then I am mid-chapter-edit. Alex is between drafts, in that glorious limbo of “free”/anxiety “time”. I am not. So type type type.